Well, I was going to write a post called ‘Ten Things I Hate About Entourage’ but then I stumbled across a story about an Octopus named Otto, so what with Octopodes being one of my favourite creatures on the planet, I decided to write this article instead. Before I get to the ten facts, I should tell you the story of Otto. Otto lives in the Sea Star Aquarium in Coberg, Germany, where one day a mysterious thing started to happen. Staff were dismayed to find that the power to the aquarium was blacking out, stopping all the pumps for the tanks and threatening the very life within said tanks. They were obviously worried about these odd occurrences, and so they took turns sleeping in the aquarium. Eventually they found the source of the problem. Otto, the 2 foot 7 inch Octopus, apparently annoyed by a 2000w overhead light had discovered that he could swing himself up onto the side of his tank and bullseye the light with a carefully aimed water jet, extinguishing it and causing the aquarium-wide power outages at the same time. The crafty little Cephalopod is already known for his mischievous nature, periodically rearranging his tank, throwing stones at the glass and damaging it, and – my favourite – juggling hermit crabs. Octopus arms are commonly referred to as tentacles, although this is not strictly speaking true. The Octopus arm is a muscular hydrostat, much like the tongue of a human. 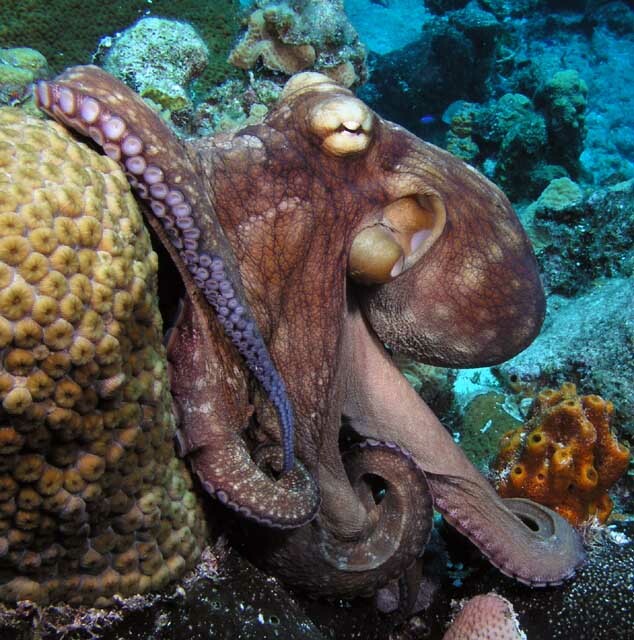 Over half of their nervous system is in their arms – A severed Octopus arm will still pick up food and push it towards where the mouth used to be. Although they can use any arm for any job, researchers have found that they have a favourite arm or two, which they will often use in preference. As of 2009, they are the only invertebrate to have been observed using tools – a trait once only thought to be human. Not only can they use tools, but have both a short-term and long-term memory, excellent cognitive and problem solving skills – and there are many examples of this behaviour. Opening jars, playing with toys, escaping tanks to eat stuff, and as mentioned above, shooting at lights are all documented Octo-acts. They are masters of disguise and camouflage, to the point of becoming effectively invisible. They apparently also change colour according to mood. Red means happy. Most species of Octopus have no bones or shell whatsoever, the only hard part of their body being a beak. this means that they can squeeze through tiny gaps many times smaller than themselves. The Octopus’s Garden, while it sounds jolly, is actually a collection of bones, shells and spines outside the entrance to the Octopus’s den, the discarded remains of its many meals. The female Octopus in some species can have a couple of hundred thousand eggs, which it will gather in its arms, and hide in its den, attaching in strings to the roof. It will care for them for about a month, blowing streams of water over them for oxygen, until they hatch. During the egg-caring period, the mother Octopus will not hunt, instead sometimes choosing to eat a couple of her own arms if she gets peckish. Eventually when they hatch, she will not be strong enough to defend herself, and will shuffle off somewhere to either die or get eaten. So there you have it. Octopodes are fully awesome. I’ve included a cool video below, plus a couple of other Octopus-related link for your delectation. Something I should point out, by the way: Octopi, Octopodes and Octopuses are all current, allowable plural terms. I prefer the term Octopodes. On a final note, I guess everyone who is paying any attention to the world cup will also be aware that “Paul the Psychic Octopus” correctly predicted all of Germany’s outcomes in this world cup, including their defeat by Spain last night. For the record I think a psychic Octopus is about as likely as a psychic human, dog or blade of grass. UPDATE: I’ve had lots of positive comments about this post, thanks so much for all your kind words and link backs! I’m really glad everyone enjoyed my article! I’m @badhex on twitter if you want to follow me. I’ll leave you with one more bonus fact: Octopodes have not one, not two, but THREE hearts. That’s enough love for anyone!